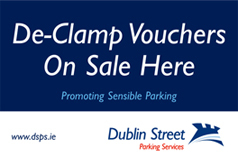 You can pay cash for the de-clamping of your vehicle, by buying a de-clamp voucher. Please click on the link below to locate the Payzone – Declamp Voucher Agents. Or where you see the “De–Clamp Voucher On Sale Here” sign. After purchasing the voucher, you should ring the DSPS control base Telephone: (01) 602 2500 with the voucher number, which will activate the de-clamp process.